Southcoast Today has the UMMB at the Tournament of Roses. Metro West has local musicians playing with the UMMB in the Rose Parade. The Keene Sentinel has local musicians at the Tournament of Roses with the UMMB. WAMC has a short audio interview with UMMB diretor Tim Anderson. WWLP Springfield has the UMMB prepares for the Rose Parade. 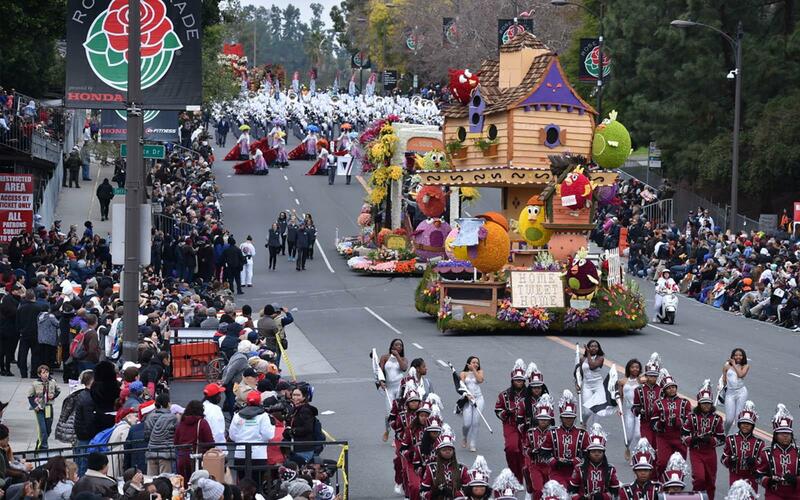 The Rose Parade Twitter feed. The Rose Parade's official site. Security is high in Pasadena. Tennesse RB John Kelley declares for the NFL draft. He had 101 yards against the UMass defense. OT, but ATL Today reports Georgia basketball is having a great start to their season. (except for a "baffling" loss to UMass). The Worcester Telegram has the UMMB is headed towards the Rose Parade. The Hampshire Gazette has an editorial that says UMass shows its prowess with its band, a battery and dirt. Fellow Independent New Mexico State plays Utah State today in the Arizona Bowl at 5:30 pm. If you missed it, James Madison will meet North Dakota State in the FCS Championship on January 6th. That's a long season for the teams that make the championship game. BC coach Steve Addazio feels the Eagles future is bright with ACC Rookie-of-the-year A.J. Dillon. 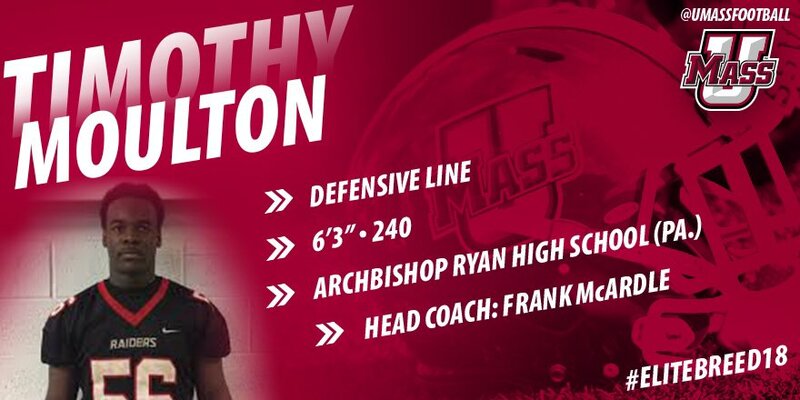 UMass fans will get to see Dillon in person when the Minutemen play BC on September 1st, 2018 at the Heights. MassLive has the UMMB is Pasadena bound. The Salem News has locals that will march with the UMMB on New Years day. Northeast Public radio says the UMMB is preparing for the Rose Parade. The Boston Globe says it's a long haul for the UMass Marching Band. I watched the Boston College-Iowa game last evening. I can't help regretting UMass did not get A.J. Dillon when we recruited him. He's just an awesome back. He would have changed the program here. IMHO, Dillon is the most NFL-ready back in the nation. It'll be interesting to see how long he stays at BC. Howard Herman of the Berkshire Eagle has a post on long time UMass assistant and head coach Jimmy Reid. UMass recruit Elijah Johnson was named to the 2017 All-State Super 26 football team. The team is selected by the Massachusetts High School Football Coaches Association. Another MAC team lost a bowl game yesterday as Duke dominated Northern Illinois. That put the MAC at 1-4 for the 2017 bowl schedule. UMass opponent Ohio supplied the MAC's only win. BC meets Iowa today in the Yankee Stadium in the Pinstripe Bowl. 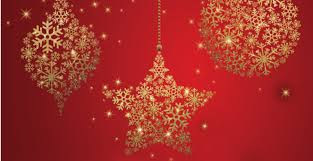 Merry Christmas and a Happy New Year to all.Hope your Christmas is merry and bright! 2017 brought some wins for UMass fans. Let's hope 2018 bring more improvement. There will be no blog post tomorrow (the 26th) as Mrs Blog and I will be traveling. Jake Ounstead, 6-0 260 pound DT from Mt Douglas, British Columbia, Ca has been offered by the Minutemen. This article reports Ounstead will take an official visit to UMass and will likely sign. Video from the US Army All-American combine also highlights from an all-star game. 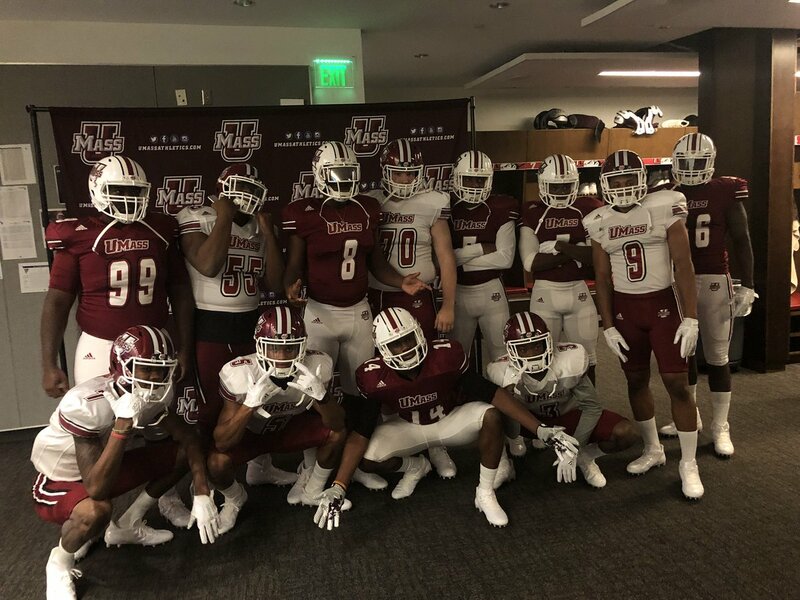 Mike Traini of "Fight Massachusetts" has a writeup on the 14 signees UMass landed in early signing period. UMass still probably has 6 to 8 scholarships to give. The Minutemen have two verbals still unsigned, so if they do, the number of slots to fill would drop to 4 to 6. UMass still needs a TE and a kicker. Whipple has hinted the Minutemen staff could look to go the JUCO route for those positions. I'd add a JUCO or transfer offensive lineman also. OT, but Howard Herman of the Berkshire Eagle says maybe it was a good thing Pat Kelsey bailed on UMass hoops. Appalachian State crushed Toledo 34-0 in the Dollar General Bowl. I watched that game and Toledo looked like they forgot to get off the bus. That's the second dominating win by a UMass opponent. Ohio was all over UAB 41-6. 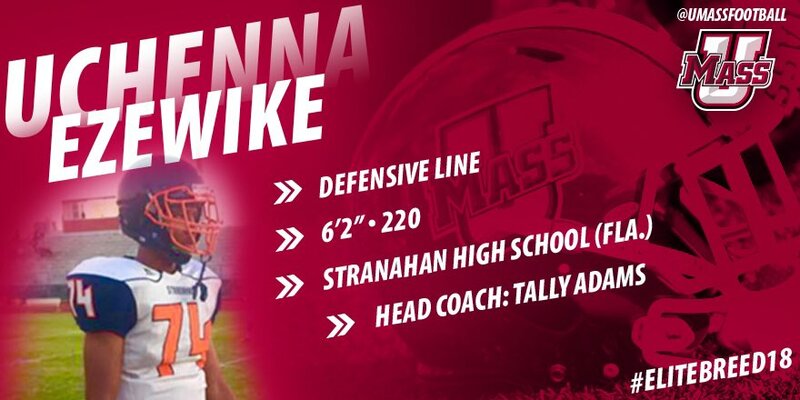 UMass added another commit Friday. 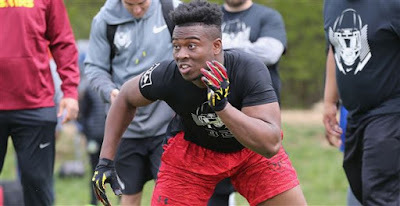 Ezewike is a 247Sports three-star player. I blogged about Ezewike back on December 14th. 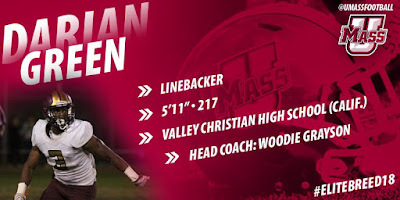 Howard Herman of the Berkshire Eagle has a post on the Minutemen's early signing period. Dr. James Ralph, physician to UMass athletics for many years has passed away at the age of 83. Former UMass assistant coach Ted Roof has joined the North Carolina State staff. Ohio dominated UAB in the Bahamas Bowl 41-6. What has not been mentioned much is UAB whio was picked #130 in preseason articles, won eight games this year and went to a bowl. Lots of progress in one year. Appalachian State meets Toledo today in a contest featuring two league champions. 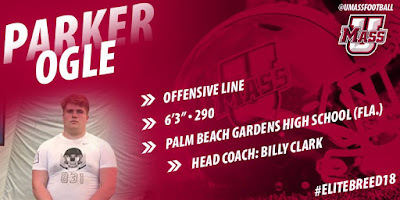 Mark Chiarelli of MassLive has a story about UMass' first early signing day. 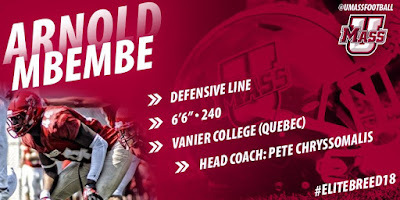 "Whipple expects multiple transfers from the junior college ranks (he's had success nabbing tight ends who take circuitous roots to Amherst) to enroll at UMass in January, and signee Parker Ogle will graduate high school in December and enroll as well." Matty Vautour has a post on Whipple's comments on UMass' early signing day. Matty says there will be a number of late transfers, which could include a kicker. Texas CB Eric Hallett did not sign with Washington State. His other visit was to UMass, so he may still be in play. Liberty announces 2020 and 2021 schedules that include UMass. Temple beat FIU 28-3 in the Gasparilla Bowl. Two more of UMass' 2017 opponents play today. Ohio meets UAB in the Bahamas Bowl and Appalachian State plays Toledo in Dollar General Bowl. 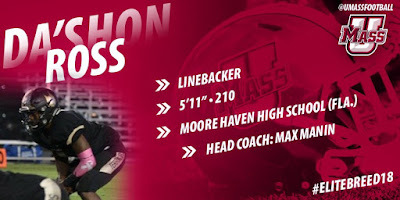 UPDATE: The UMass website has bios for all of yesterday's commits. Matty Vautour has a story on the 12 recruits who signed yesterday. Mike Traini of "Fight Massachusetts" has a post on what we've learned so far in the early signing period. 247Sports has UMass currently at #105 in the 2018 recruiting class rankings. The Minutemen will probably sign 6 to 8 more recruits, which should push us at least into the 90's. 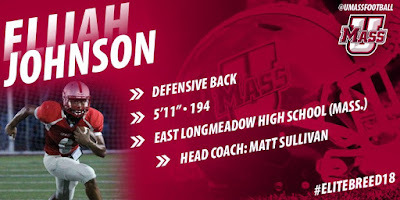 MassLive.com has a story on East Longmeadow's Elijah Johnson signing a letter-of-intent with UMass. Julius Welschof, who camped at UMass and was discovered by UMass alum Brandon Collier, signed at Michigan. Two New England players with UMass offers, Jehlani Galloway and Ryan Betro signed with Boston College. Will Lewis and Pat Freiermuth, both with UMass offers, signed with Penn State. Will Froumy an OL from Exeter, NH signed with Syracuse over a Minutemen offer. 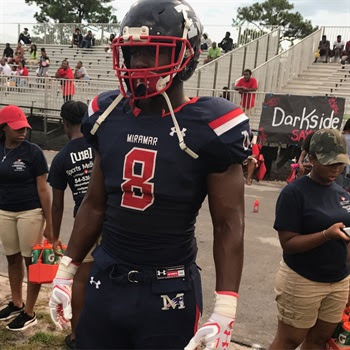 Moulton a 247Sports two-star recruit. This article from Philly.com features Mouton. Hudl.com has video of Ross. 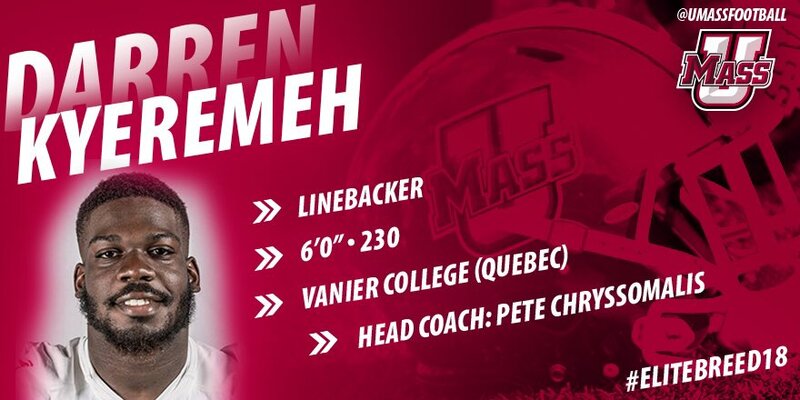 Rated as a Top-Five recruit from Canada. 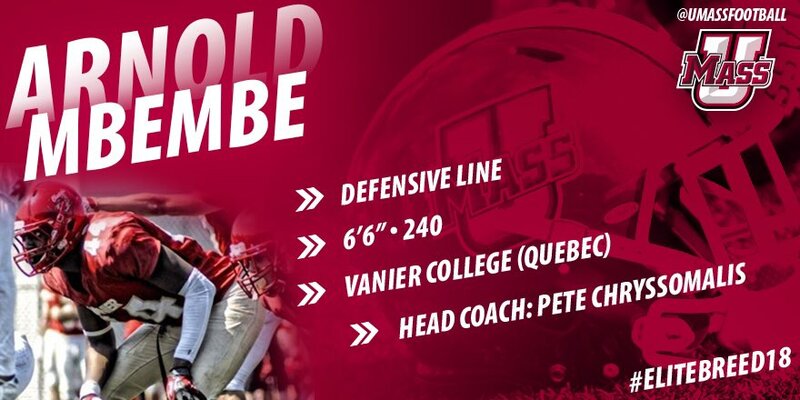 Canada Football Chat's #1 Canadian prospect. News about UMass' early signings probably won't come in for a while. Mike Traini had a post on early signings on the 19th. 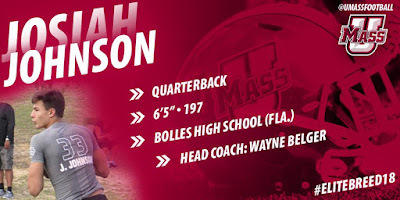 The UMass website has a story on the Early Signing and how to follow along. I'll likely be doing some updates later in the day. The Shreveport Times covers future games for LA Tech and mentions their 2019 game against UMass. Lancaster Online reports Jose Barbon, a 6-0 180 pound WR from Conestoga Valley verbaled to Temple over an offer from UMass. Temple is a seven-point favorite over FIU in tomorrow's Gasparella Bowl. 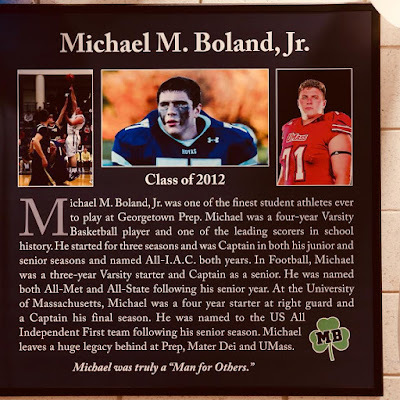 Mike Traini of "Fight Massachusetts" has a post on tomorrow's Early Signing Day. Mike also has a post on Ryan Bamford's question-and-answer session from yesterday. Several point are relevant to UMass Football: He's working on more package football and basketball series. This is a smart move. Scheduling games as an Independent can be difficult. Bundling makes us more attractive and gives us options with scheduling. 2016 is a year when we had no options and we don't want that situation to reoccur. 1. Recruits for the front seven on defense. I liked the work of Joe Previte and Jake Byczko this year. Cole McCubrey and Jarell Addo also showed promise. We've had two HC's since we moved to FBS. Both coaches were offensive guys. In six years of FBS football, I can only remember one game (Georgia Southern) where we offensively blew out the other team. All the rest of our wins were defensive grinds. We scored 95 points against Ohio and FIU and lost both games. 2. A kicker. Consider Temple; we've played twice and twice played well enough to win. Temple had a kicker and we didn't. 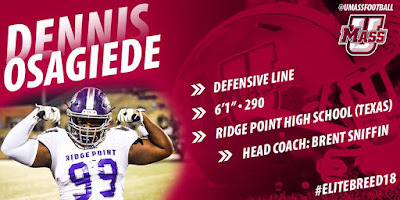 I'm not asking for an All-American, but we can surely ask for a guy as good as the Owls have. 3. A tight end. Whipple's offense works best with a pass-catching TE. Travis Reynolds looks like a good athlete, but did not get targeted a lot, which is understandable with Breneman on the roster. If we don't have a pass-catching TE on the roster, then we need a transfer or JUCO. 4. A JUCO or transfer offensive lineman, preferably a RG to pair with Jack Driscoll so we can get our running game going. Former UMass QB James Sosinski is doing well as a forward on Kansas' hoops team. OT, but Georgia HC Mark Fox said it wasn't UMass, it was the schedule. Somehow we never play good, the opposing team is always off their game. BTW, I like what's happening with UMass Hoops and Hockey. I was expecting a 8-22 season with basketball, but if UMass keeps playing like they did Saturday, the Minutemen could get an NIT bid. 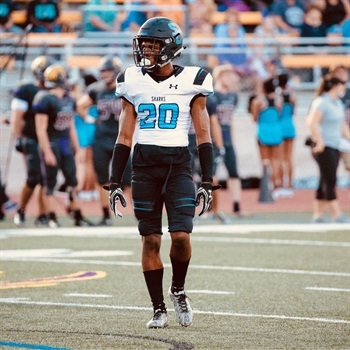 Kaymen St. Junious, a 5-10 170 pound Safety from Pearland, TX has Tweeted he's received an offer from UMass. Besides UMass St. Junious has an offer from Oregon State. Mike Traini of "Fight Massachusetts" reports UMass looks to add more games with Coastal Carolina. Myrtle Beach online has the original article. A Bleacher Report writer has a post on coaches who will start 2018 on the hot seat. The list includes two UMass opponents: BYU and Charlotte. An Appalachian State DB points to the Mountaineers' game against Andrew Ford as a learning tool against Toledo on December 23rd. Ford and Comis combined for 20-33-190 2 TD's against Appalachian State. The Mountaineers finished second in both scoring and total defense in the Sunbelt. With the Winter Solstice coming up, join the UMass community at the UMass Sun Wheel near McGuirk Stadium. Joseph Girard III, a 6-1 180 pound QB from Glens Falls, NY has Tweeted he's received an offer from UMass. He's also a three-star hoops prospect. This article features Girard as a two-sport athlete. This article says Girard could be open to playing both sports. Scored 60 points in a game recently. Girard has 14 hoops offers including BC and Penn State. Tulane has also offered in football. 247Sports report Caleb Okechukwu has UMass as one of his two finalists in his recruiting. Okechuikwu is a 6-4 252 pound DE from Washington, DC. Okechukwu has five FBS offers. Nine Minutemen on Phil Steele's first team All-Independent squad. Six more on the second team. Athlon Sports has UMass ranked #106 ofter week 13 of college football. The bowls won't change UMass' ranking. Today's UMass hoops game is part of a football/basketball package with Georgia. UMass will play the Bulldogs in Athens for the last game of the 2018 season. The Boston Herald picks all the 2017 bowls. Troy University, led by former UMass coach and player Neal Brown plays North Texas in today's New Orleans Bowl. 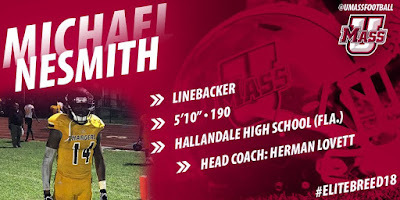 Hansky Paillant, a 6-2 230 pound DE from Hollywood, FL has Tweeted he's received an offer from UMass. This post from Miami CBS local features Paillant. Named defensive MVP in 21st annual BCAA All-Star Classic. Paillant is currently an Appalachian State commit. He has five offers mostly from Florida schools. USA Today has a story (mentions UMass) about the finances of the FBS Playoffs. A true playoff, like the ones we have talked about here in the past would be a huge moneymaker for everyone involved. Currently, the bowls retain a disportionate amount of influence on FBS post season. With viewers down from the social media revolution, a true playoff would reclaim some the eyeballs lost to social media. The current bowl system is archaic. The UMass Martching Band prepares for its appearance in the Rose Parade. The UMMB will display their new uniforms at Saturday's hoops game. The NY Post picks the winners of every 2017 Bowl. Uchenna Ezewike, a 6-3 220 pound DE/LB from Fort Lauderdale, FL has Verbaled to UMass. 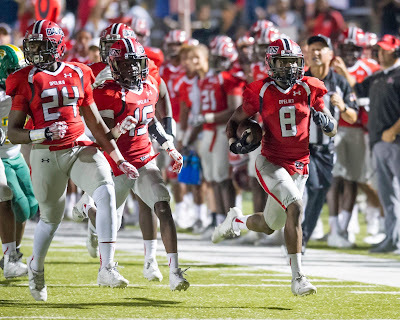 This article from October 2017 features Ezewike's recruiting. 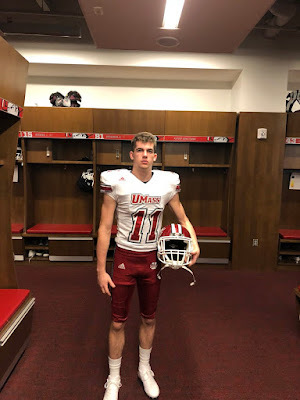 Mike Traini of "Fight Massachusetts" has a post on his verbal to UMass. Ezewike chose UMass over six other FBS offers including Pitt and Kentucky. Syracuse.com reports Lakiem Williams, a 6-2 240 pound LB from Butte College has verbaled to Syracuse. Williams had offers from UMass, Toledo, Cal, Houston and others. With both the Early Signing Period and Letter-of-Intent day coming close, one unit that could use some three-star recruits is the UMass offensive line. The OL played better (as did the whole team) after the two-week break. But it had some serious struggles in the first six. UMass gave up 46 sacks for the season. That's second-to-last in the NCAA. Hawaii collapsed the pocket the whole game with just their front four. Against Temple we hit a special teams and OL low point. Temple won by nine. They made three field goals and we missed three. 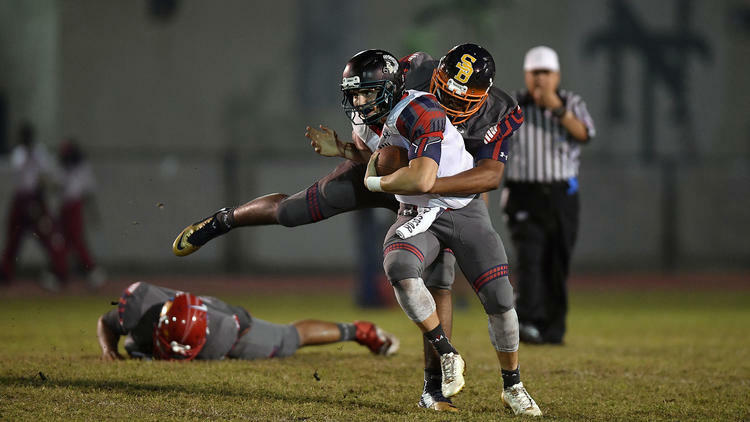 The Minutemen gave up nine sacks and 11 tackles for loss. Despite that, Ford threw for 377 yards and 2 TD's. Not being able to run the ball against Power Five opponents is no disgrace, but 79 yards rushing against Coastal Carolina and 79 against Old Dominion is. We also got pushed around by Maine. James Madison gives a ten year extension to Mike Houston. The Dukes are currently 13-0 and meet South Dakota State in the FCS playoffs Saturday. Justin Lewis, a 6-0 175 DB from Opelika, AL has Tweeted he's received an offer from UMass. 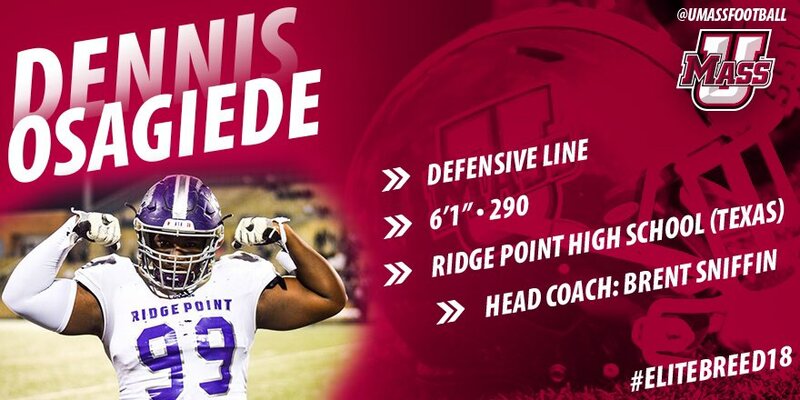 UMass is the first offer for Lewis. 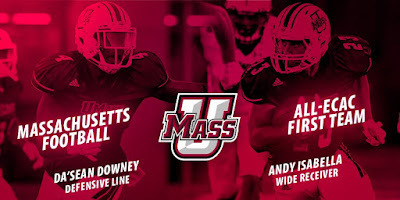 Matty Vautour reports UMass will change Special Teams coach and TE's. The contracts of Mark Michaels and Jason Palermo will not be renewed. Mike Traini of "Fight Massachusetts" has a post on the coaching changes. Penn Live.com catches up with Adam Breneman. 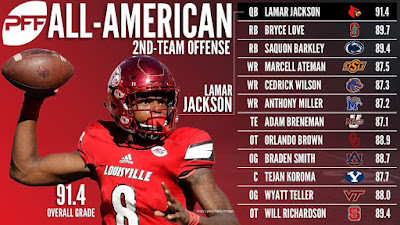 The All-American has Breneman as first team All-Group of Five. 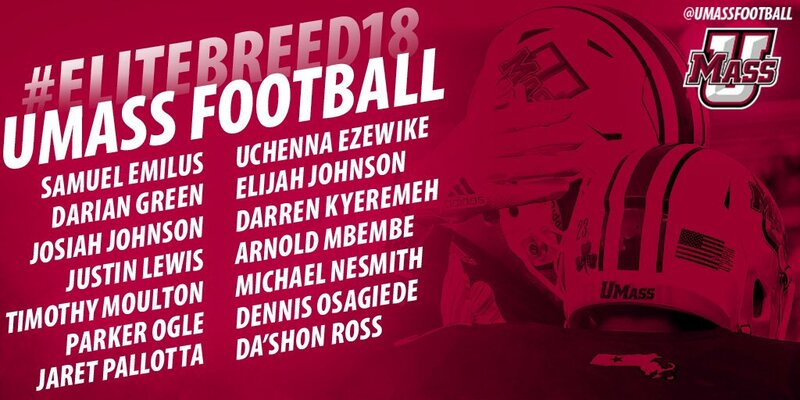 Breneman has accepted an offer from the Senior Bowl. If you missed it, New Hampshire was bounced from the FCS playoffs by South Dakota State. Mike Traini of "Fight Massachusetts" recaps the FIU game. There are no other fullbacks on the roster. 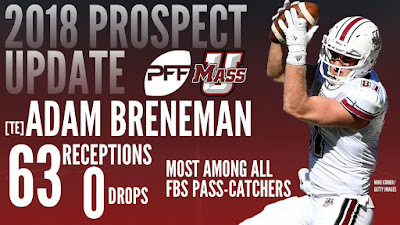 Breneman was a big part of the UMass offense and Whipple's offense in general works best with a pass catching TE. Taylor Edwards RSFR 6-4 255. A former three-star recruit who came off a knee injury in 2016. Jon Lucier RSSO 6-6 240. DNP 2014, 2015, 2016, 2017. Travis Reynolds RSSO 6-5 255. 8-5 GP-GS 2-20 15 LONG. Of the 24 players listed on the November 27th depth chart on offense, nineteen return. The Minutemen offense was 37th out of 130 FBS offenses in 2017. I would think UMass fans could expect another good year in 2018. AJC.com previews Georgia's 2018 season. Has a nice image of Andy Isabella.Thanks to the blog reader who sent me the link. 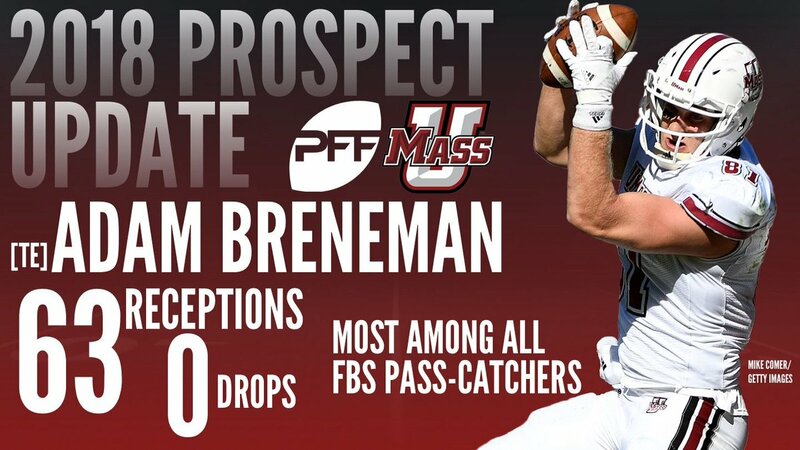 Adam Breneman is 2nd team All-American by Pro Football Focus. 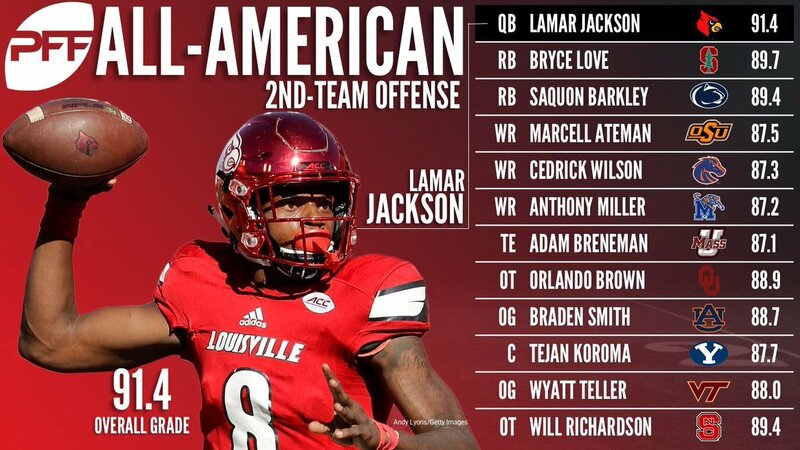 The Athletic.com also has Breneman as a 2nd team All-American. The UMass Football Twitter feed has the above image about Michael Bowland. It's a shame his life was cut short. James Madison won a thriller in the FCS playoffs. 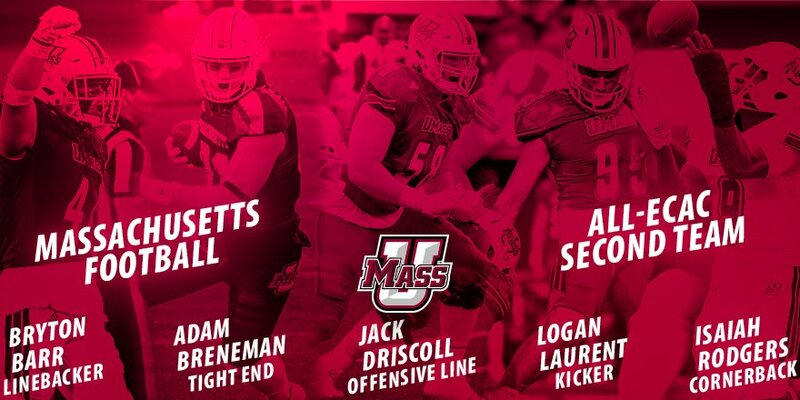 Seven UMass players made the 2017 All-ECAC list. All four played an important part in UMass' four victories. Whipple's offense works a lot better with a pass-catching TE. We've been talking about Logan Laurent's six-week stardom. Da'Sean Downey finished eighth in the nation in TFL. Bryton Barr was 38th in the nation in TT. Three of the players named were underclassmen. Andy Isabella was 21st in the nation with 65 catches for 1020 yards. He was 43rd in the nation with 5.4 receptions per game. 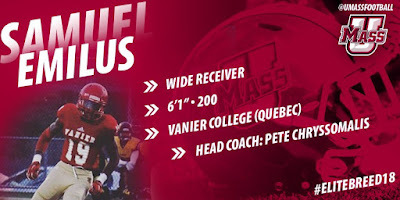 His 65 catches ranked #8 in UMass all-time single season receptions. He was #7 in single season receiving yards, moving Rasheed Rancher (1007 yards) down one notch. His ten receiving TD's tied him with Jason Peebler for 4th in single season TD receptions. Isaiah Rogers went 12-12 GP-GS 35 UT (4th on the team) 15 AT 50 TT 3.0 TFL 3 INT's 14 BKUP (1st on the team). Jack Driscoll went 9-8 GP-GS. The offensive line played better the last six games of the season. The offensive line gave up 32 sacks in the first six games of the season and 14 in the last six. Mike Traini of "Fight Massachusetts" looks UMass 2018 recruits who may be involved in the early signing period. Off Tackle Empire discusses the bowl game between FIU and Temple and manages not many conclusions. Matt Araiza, a 6-2 186 pound K/P from California has Tweeted he's received an offer from UMass. Max-Preps All-American in 2016. MaxPreps also has kicking stats. Thanks to the blog reader who pointed me to this USA Today article on assistant coaches salaries. UMass is near the bottom of the barrel in assistant coaches salaries. This is another reason a league affiliation would help. Of course, not all leagues are in good shape. In yesterday's Matty Vautour article he mentioned Coach Whipple is looking for some transfer or JUCO help with punting. During the second half of the season Logan Laurant took over and had a great six weeks. In two of our biggest victories to date he was the key factor in the game. He kicked the game-tying field goal and then the winner in overtime. His three field goals were the difference in the BYU game. In addition, he was booming his kickoffs into the end of the Cougars' endzone all game. Mike Caggiano-- JR DNP in 2017. I don't know what happened to him. Evan Padilla--FR He drew some oblique praise from Whipple, but DNP in 2017. Theo Young--RSJR. DNP in 2014, 2015, 2016, 2017. 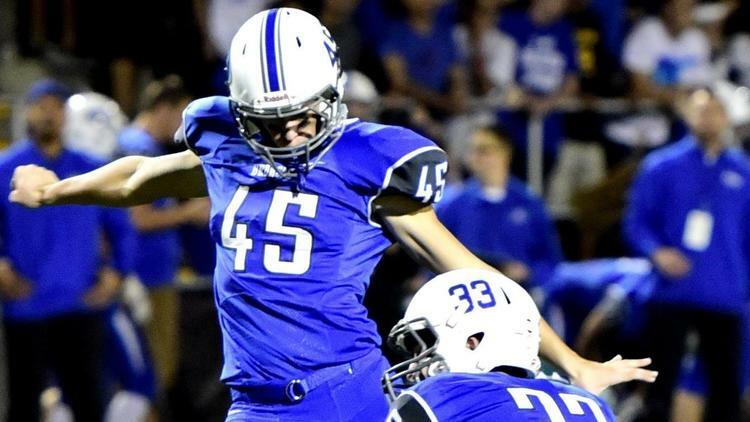 Michael Schreiner---FR Had a solid start in kickoffs and extra points (10 for 10 in the first three games). Then missed one field goal against Coastal Carolina and three against Temple. Then missed his next extra point against Tennessee. We've had five-and-half years of terrible kicking and six weeks of outstanding kicking and punting. It's no coincidence those six weeks were the best of our FBS era. A decent punter and kicker should be a priority recruiting goal. 12 GP 480-2375 4.9 AVE 27 TD's 197.9 AVE/game. UMass finished 99th out of 130 teams in rushing offense. The Minutemen finished 100th out of 130 teams in rushing defense. UMass finished #111 out of 130 teams in Keepers College Football rankings. 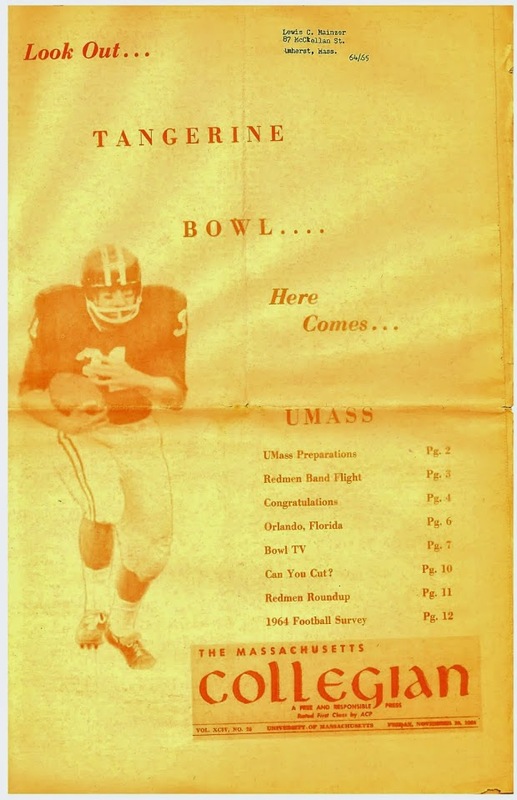 This Hero Sports article forgets UMass played in the Tangerine Bowl. Also they have the Minutemen playing two FCS teams in 2018. SB Nation ranks the FIU-Temple bowl game last in "watchability". Matty Vautour has an article about UMass football having an interesting off season. He mentions the possibility that UMass defensive coordinator Ed Pinkham could get an offer from another staff. 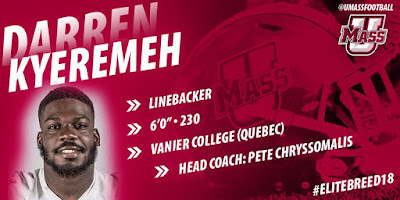 While UMass could not match a Power Five offer, the Minutemen currently do not have a "assistant head coach". UMass could offer him a raise or extension and the assistant head coach title. I would hope UMass could keep him. The two best wins of 2017, and they were the two best wins of the program in the FBS era, were Appalachian State and BYU. Both games were defensive gems. Matty mentions the Minutemen will have six QB's on the roster if no one leaves. Andrew Ford has already said he's staying. Ross Comis, Randall West and JUCO Mike Curtis are currently on the roster. UMass adds Jake Pallotta and Josiah Johnson. Matty says Whipple stated he's received some feelers about grad transfers and is looking at some JUCO's on defense and punter. He mentions possible breakout players for 2018. Jordan Fredericks joins the running backs. Chinedu Ogbonna and Jake Byczko will be available for the defensive line. Ogbonna played in eleven games in 2017 and Byczko in twelve. Byczko had 23 TT and three TFL. Ogbonna had 10 TT. At linebacker, Mike Ruane and Cole McCubrey will complete for playing time. McCubrey had 14 TT and appeared in eleven games. Ruane appeared in ten and had one tackle. 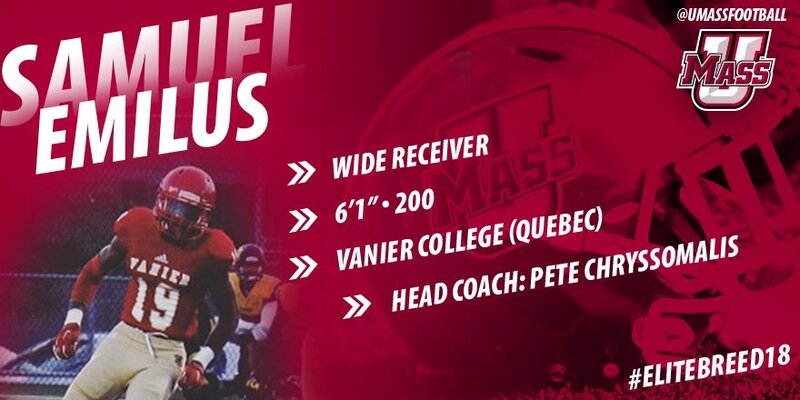 Claudin Cherulis, Xavier Steele and Tyrus Lebeau will be available at Safety. Steele appeared in seven games and five TT. Cherulus and Lebeau redshirted. Chris Hunt and Brian Roberts will join the cornerbacks. Brian Abosi joins the offensive line. Zak Simon, Silky Brown and Melvin Hill will join the receiving corps. The UMass Daily Collegian has a post about Whipple's extension. The Boston Herald has a post on Whipple's contract extension. Adam Breneman finished 11-11 GP-GS 64-764 4 TD's 11.9 AVE 41 LONG 69.5 yards/game. Zero drops for the season. The UMass Daily Collegian reports the Minutemen fell to FIU 63-45. Temple and FIU are going to meet in the Gasparilla Bowl. Ohio is playing UAB in the Bahamas Bowl. Appalachian State plays Toledo in the Dollar General Bowl. Buffalo, UTSA and Western Michigan all finished 6-6 and did not get a bowl invite. I had a bad feeling about this game. I can't really complain because the FIU offense really played a great game. UMass had coverage on Panther receivers all game, but they made the catches. The UMass offense scored 45 points and that should be enough to win. The Minutemen could not stop the FIU running game. FIU runners would squirt between gaps and make eight yards every time. FIU QB Alex McGough was flushed out of the pocket by UMass defenders, but he repeatedly hit his receivers on the move. He just had a hot game. Anyway, it was a good year for us. We have a lot to build on. Next year's schedule is reasonable and we should expect more progress. MassLive says UMass closed the season with a loss. Matty Vautour reports FIU sets records in a win over the Minutemen. Matty reports Whipple will get a contract extension. The Miami Herald says it was a convincing win for FIU. Appalachian State trounced Louisiana to share the Sun Belt Championship. Coastal Carolina beat Georgia Southern for their third win of the season. New Hampshire upset Central Arkansas 21-15 to advance in the FCS playoffs. I don't know if you saw it. but UNH drew only 2,300 fans in last week's first round win in Durham. James Madison knocked fellow CAA member Stony Brook out of the playoffs with a 26-7 win. The 2017 season ends today. It's been a remarkable year for UMass fans. The football program hit a FBS low (the loss to Coastal Carolina) and three new highs (four wins, victories over a league-leading team and BYU away). It would be nice to keep rolling with a win over FIU. It would really send the program into the off season on a high note. It's always more fun writing the blog the week after a win than a loss. It would give me a warm glow for the next 266 days until August 25 2018. I'll be watching and cheering for the Minutemen. Go UMass! Matty Vautour reports UMass wants to finish with a win. 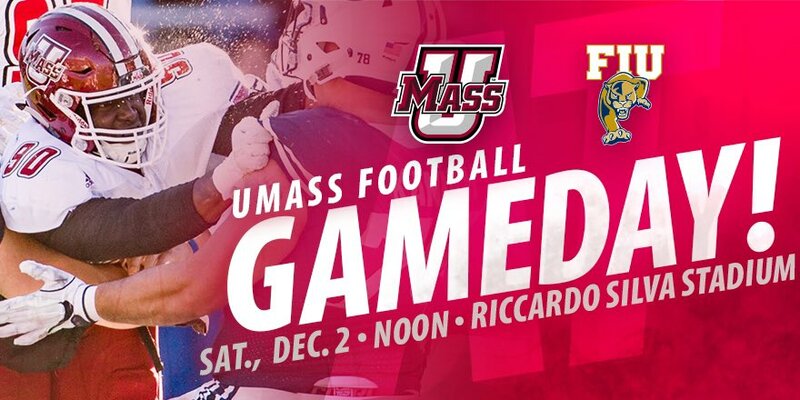 The Boston Herald says UMass LB Steve Casali wants to finish his career with a win. The Miami Herald reports FIU is holding its own among Florida college teams. 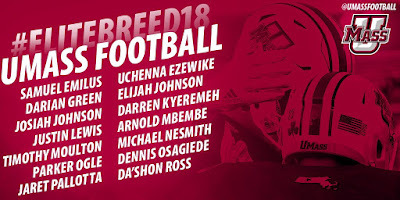 FBS Schedules has a post on FCS Southern Illinois adding UMass, Arkansas State and Northwestern to its future schedules. SB Nation has the complete 2017 bowl calendar. Land of Ten picks FIU to play Temple in the Boca Raton Bowl. FIIU is having a breakout year. The Panthers went 4-8 in 2016 and a win over UMass will reverse that score and set a program record eight wins. FIU returned six starters on offense and nine on defense. The Panther are coming off perhaps their best win of the season a 41-17 destruction of WKU. The Panthers lost to common opponent Old Dominion 37-30. They are 96th in scoring offense with 24.3 points per game. The Panthers are 69th in scoring defense. FIU QB Alex McGough is #50 in passing efficiency, but has been hot lately. He completed passes to ten different receivers in the win over WKU. FIU's other impressive win was a 41-30 win over Marshall in Huntington. The Panthers rushed for 224 yards against the C-USA's best rushing defense. Both UMass and FIU have improved over the teams that met the last two times. I think UMass has improved more and has a good chance for its second road victory of 2017. Coming off a bye week the Minutemen should be healthy, and should score points against the Panthers. The UMass defense is coming off maybe its best performance ever against BYU. I think they can again get some turnovers. FIU Sports has five questions for UMass beat writer Matty Vautour. 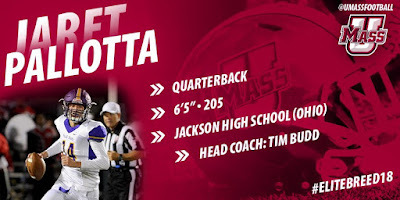 Speaking of Matty, he has a post on UMass' Camp Hill Trio. Mike Traini of "Fight Massachusetts" previews the Minutemen-Panthers game. KU Sports has a story on former UMass QB James Sosinski's journey to Kansas. A Bleacher Report writer predicts FIU 31 UMass 24. Get More Sports believes UMass will cover the spread. The Boston Herald goes out on a limb and predicts a close game. FIU won't play in the Bahamas Bowl, but there are six other bowls in play. Former UMass assistant coach Jerry Azzinaro will be named defensive coordinator at UCLA.